It’s good to be The Queen: Fashion plate, Mother Of The Nation, South African Ma Barker. 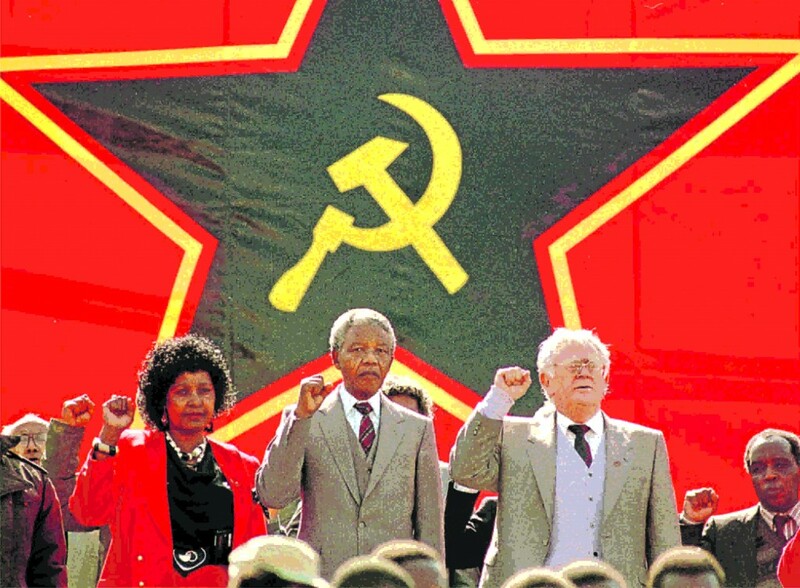 UPDATE 9/18/18: South Africa’s communists hurrying things along down the road to ruin…and in their dreams taking the whole world with them. UPDATE 4/22/18: In the absence of any more Mandelas to further ruin South Africa, Obama has actively stepped into the breach to help the doomed country along on its road to another Zimbabwe hell. UPDATE 4/2/18: She of “necklacing” and “Football Clubs” (disappeared young, uncooperative, tortured young Black men) has mercifully met her Maker. Her fate is no longer of any concern to a world she blighted. Her legacy? Thousands of dispossessed and murdered people both Black and White. And a ruined country once rich in potential and natural resources, now headed inexorably for the Dark Ages thanks to rich, greedy, power-mad demagogues like Winnie. UPDATE 3/23/18: According to one SA Marxist Mafioso and a nice, fresh new Constitutional amendment, White farmers fleeing for their lives from South Africa should “leave the keys” to their homes and equipment for the noble, deserving Blacks planning to work the lands themselves. Sounds so very much like the dreams of “Palestinians” panting for the “return” of their “occupied” territories from those nasty Israelis. A little reminder: such “transfers” (theft) of lands and properties never work out to the benefit of the proletariat. Free, unfettered private ownership is the only incentive that builds a civil, prosperous society and makes lands and people thrive. But then, that’s never really been the goal of the Marxist Mafia elite, has it? 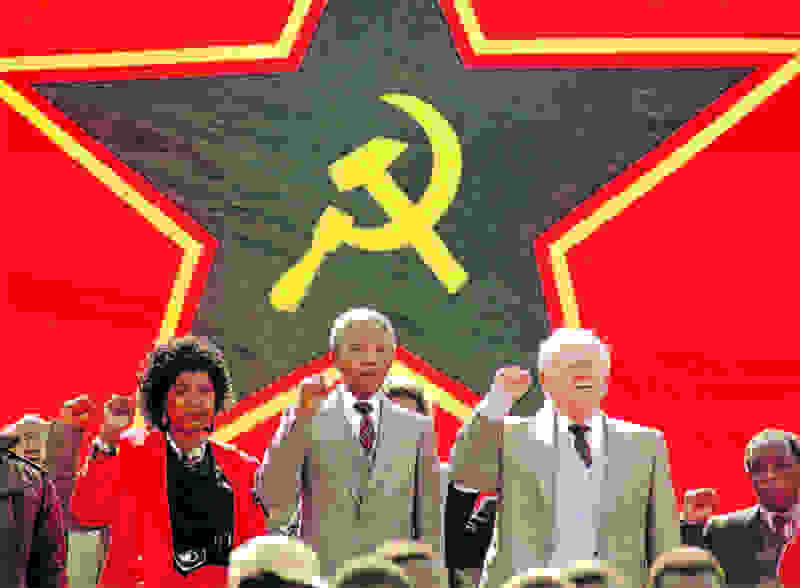 UPDATE 3/1/18: SA goes full-tilt Communist as dreamt of by its corrupt “reformers” like Winnie and the deified Nelson. The new Parliament headed by a newly elected President has voted to confiscate White farms and redistribute to Blacks. As is always the case with vengeful racial reparations, this “justice” will surely result in peace and prosperity for the new recipients and the country at large…as in, for instance, neighboring Rhodesia (Zimbabwe). Sad for SA. Luckily in Israel, they’ll never succumb to this Big Lie. Winnie Mandela is one of those profoundly unpleasant, power-hungry women whose only accomplishment is getting a charismatic man to marry her. For one Miss Rodham, it was Bill Clinton. In Winnie Mandikizela’s case, it was South African Marxist revolutionary Nelson Mandela, imprisoned for decades for fighting his country’s cruelly embedded apartheid policies. Beginning in the Sixties, Mandela’s martyrdom captured the world’s attention and eventually he was freed, becoming SA’s first Black president, mercifully dismantling apartheid in the process once and for all. By convenient association, his wife Winnie was cast as the Martyr’s Wife, the celebrated “Mother” of the new South Africa, but her story and ultimate reputation are somewhat less attractive than her husband’s saintly image. By all honest accounts, she is in love with money, power and all the luxuries attached to being a typical Leftwing figurehead and celebrity. She is also a cold-blooded killer, the notorious First Lady of Necklacing, the grisly practice of forcing a rubber tire doused in gasoline over a victim’s head, then striking a match. Significantly, the terrorized victims were always other Blacks-local policemen, teachers, civil servants, political opponents-accused of collaboration with the existing White order. Promoting the killing of police in this manner and paving the way for domestic terrorists like Black Lives Matter, this murderous diva made it adequately plain that this would be the fate of anyone daring not to fall into Marxist lockstep with the revolutionary mob who made her rich, revered and politically powerful. 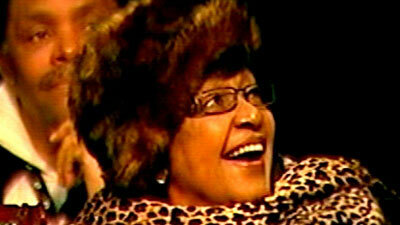 Nelson Mandela himself had to divorce this embarrassing harridan, but she has refused to go away. Since his death, she has continued to play the grieving widow, simultaneously reviling her meal-ticket-for-life, sicking an army of lawyers to contest his unambiguous, legally documented wishes to disinherit her. That such a sociopath continues to be celebrated as a national heroine, most recently on her 80th birthday, only underscores the corruption of the new South Africa. Getting rid of apartheid was a cause that honorable, civilized people everywhere could easily support without hesitation. Its demise was a cause for celebration worldwide. Sadly, the old story has been played out again: cruelty replaced by utter corruption, a new entrenchment of an Elite Few intent on an absolute power of its own, the general populace no better off, possibly worse. So while Winnie Mandela continues to enjoy her Mercedes’, the fanciest clothes, the best plastic surgeons and ongoing admiration and worship, South Africa remains hell on earth, only now its new tyrants are Black. Orwell’s Animal Farm pigs are indistinguishable from Farmer Jones and the rest. So it goes…again. Should there be any doubt about long-range goals: Winnie & Nelson Mandela, Joe Slovo, Stalinist head of South African Communist Party.